Mr. Noel Sanchez was appointed as the Assistant Director for Border Security at the Laredo, Texas Field Office in December 2010. As Assistant Director for Border Security, he was responsible for all activities related to the admissibility of people, addressing and preventing threats of terrorism, and the deterrence of smuggling of contraband and narcotics through the eight ports of entry in the Laredo Field Office. Mr. Sanchez also served as the Acting Director for the Laredo Field Office from January to July 2014. As Acting Director, Sanchez provided oversight and guidance to the operation of eight ports of entry extending from Brownsville to Del Rio overseeing a complement of more than 2,600 employees. In that year, CBP Officers in South Texas facilitated the processing of 2.8 million commercial trucks with a total value of imports processed exceeding $142 billion annually; 19.6 million privately owned vehicles and over 53 million passengers and pedestrians. In addition, from April 2012 to December 2013, Mr. Sanchez served as the Deputy Commander of the South Texas Campaign (STC), headquartered in Laredo, Texas. In this capacity, he was responsible for ensuring that the STC’s intent of identifying, disrupting and degrading the Transnational Criminal Organizations throughout the STC corridor was carried out utilizing CBP personnel and resources, leveraging other communities of interest, and coordinating with the Government of Mexico. ​Mr. 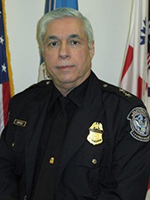 Sanchez began his federal career with the former U.S. Customs Service in January 1978 at the Port of Laredo, Texas and is a graduate of the Customs Leadership Institute with Columbia University and a graduate of the Senior Executive Fellows class at Harvard University’s John F. Kennedy School of government.